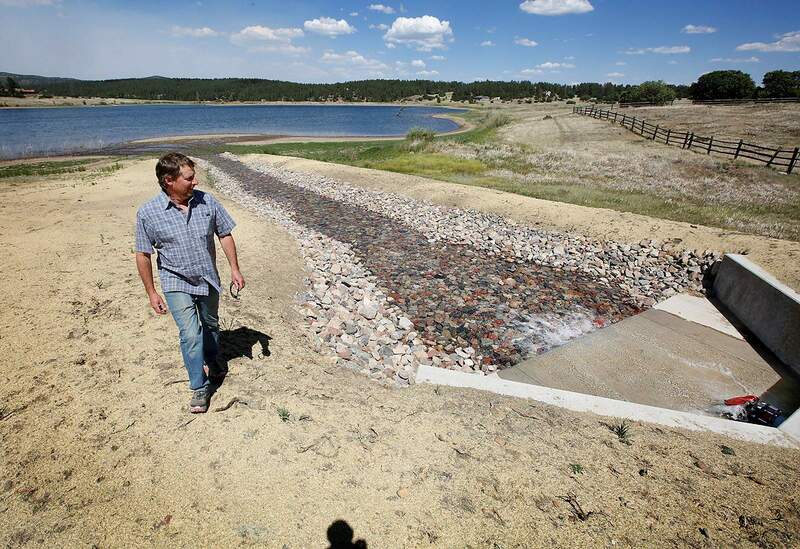 Jerry McBride/Durango Herald - Lake Nighthorse water flows into Lake Durango during a test flow that Charlie Smith, Lake Durango Water Authority general manager, is monitoring. The first water from Lake Nighthorse can now be delivered, following the construction of a pump-assisted pipeline to Lake Durango, where in drought years there can be too little to convert into potable water for homeowners. Current Lake Durango water users now have a measure of safety and there is sufficient additional water for about 400 more taps, ending a moratorium on growth on that system. This initial Lake Nighthorse water will be flowing west rather than east, and in a relatively small amount. The reservoir in the Animas La Plata Water Project was designed to flow water back into the Animas River for points downstream, and to Durango as a supplemental water source. Those who rallied to gain funding for what can be considered an add-on to ALP gathered Wednesday morning for a ribbon cutting at the pipeline’s booster pump location along County Road 210, which overlooks the northwest corner of the reservoir. Partnerships and perseverance were terms used by the speakers, who represented the Ute Mountain Ute and Southern Ute Indian tribes, the Colorado Water Conservation Board, the Lake Durango Water Authority and the La Plata West Water Authority, the last being the organizing entity which is making west- and southwest-bound domestic water possible. Funding of about $10 million from both tribes and the state, the Lake Durango Authority and – to a small extent – tap fees made the domestic water project possible. Inlet construction for the pipeline was in 2009, almost as the Nighthorse reservoir began to fill, and the pipeline was sized to permit domestic water for additional homes on the water-scarce side of the county. Speakers from the tribes spoke passionately about the importance of water, having lived for generations where there is so little of it. Lake Durango will not be drawing water as long as there is adequate water from the La Plata River in its reservoir, but a test of the pipeline a month ago delivered 25 acre feet to Lake Durango with no issues. Now, funding to construct a line to the southwest to reach an additional 200 residences with treated water has been applied for. The original plans for the Animas La Plata Project were to deliver irrigation water to western La Plata County and to the tribes, which had not received water rights following their treaty with the federal government in 1868. When anticipated costs for the irrigation component soared, the project became mostly a way to satisfy the tribes’ rights. The City of Durango has water in the project, as does northwest New Mexico and the Navajo Nation. At the ribbon cutting, the names of Fred Kroeger, Sam Maynes and Leonard Burch, former chairman of the Southern Ute Indian Tribe, were recalled. They had advocated tirelessly, in Washington D.C. and locally, for the Animas La Plata Project. They would have been pleased to finally see stored water from the Animas River put to beneficial use.